3.1 "The Burning Ashes of Ketimbang"
On 27 August, four enormous explosions occurred. At 5:30 am, the first explosion was at Perboewatan, triggering a tsunami heading straight to Telok Betong, now known as Bandar Lampung. At 6:44 am, Krakatoa exploded again at Danan, with the resulting tsunami stretching eastward and westward. The largest explosion, at 10:02 am, was so violent that it was heard 3,110 km (1,930 mi) away in Perth, Western Australia, and the Indian Ocean island of Rodrigues near Mauritius, 4,800 km (3,000 mi) away, where the blast was thought to have been cannon fire from a nearby ship. The third explosion has been reported as the loudest sound heard in historic times. :79 The loudness of the blast heard 160 km (100 mi) from the volcano has been calculated to have been 310 dB. Each explosion was accompanied by tsunamis estimated to have been over 30 meters (98 feet) high in places. 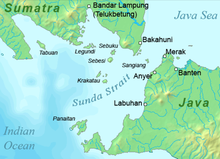 A large area of the Sunda Strait and a number of places on the Sumatran coast were affected by pyroclastic flows from the volcano. The energy released from the explosion has been estimated to be equal to about 200 megatons of TNT, roughly four times as powerful as the Tsar Bomba, the most powerful thermonuclear weapon ever detonated. 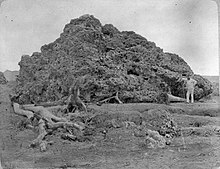 At 10:41 am, a landslide tore off half of Rakata volcano, along with the remainder of the island to the north of Rakata, causing the final explosion. ^ a b Symons, G.J. (ed) The Eruption of Krakatoa and Subsequent Phenomena (Report of the Krakatoa Committee of the Royal Society). London, 1888. Internet Archive. 1888. Retrieved 2015-05-05. 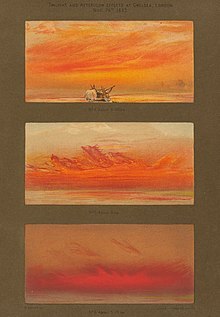 ^ "The eruption of Krakatoa, August 27, 1883". Commonwealth of Australia 2012, Bureau of Meteorology. Archived from the original on 2016-03-18. Retrieved 5 April 2012. ^ Kane, R.P. ; Kane (1997-08-01). "Relationship of El Niño–Southern Oscillation and Pacific Sea Surface Temperature with Rainfall in Various Regions of the Globe". Monthly Weather Review. 125 (8): 1792–1800. Bibcode:1997MWRv..125.1792K. doi:10.1175/1520-0493(1997)125<1792:roenos>2.0.co;2. ^ Mass, Clifford F.; Portman, David A.; Mass, Clifford F.; Portman, David A. (1989-06-01). "Major Volcanic Eruptions and Climate: A Critical Evaluation" (PDF). Journal of Climate. 2 (6): 566–593. 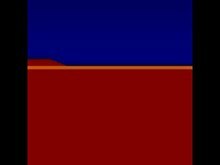 Bibcode:1989JCli....2..566M. doi:10.1175/1520-0442(1989)002<0566:mveaca>2.0.co;2. JSTOR 26194042. ^ a b "Blue Moon". NASA Science. Retrieved 2013-08-26. This page was last edited on 18 April 2019, at 13:16 (UTC).